Raonic, a former world No. 3, playing his first tournament since undergoing wrist surgery, lasted just eight minutes of his clash with Yuichi Sugita. Richard Gasquet returns a shot to Lu Yen-hsun of Chinese Taipei during their second-round match of the Japan Open in Tokyo on October 5, 2017. The Frenchman won 6-0, 7-6 (5). Milos Raonic's injury woes continued on Thursday as the Canadian was forced to retire from his second-round match against local favourite Yuichi Sugita at the Japan Open. The former world No. 3, playing his first tournament since undergoing wrist surgery, lasted just eight minutes of his clash with Sugita. Raonic had looked sharp in battering battered Serbian Viktor Troicki 6-3, 6-4 on Tuesday. But the third seed was forced to call for the trainer during the first game, clutching his right calf. He eventually threw in the towel, wincing with discomfort and limping despondently off court. Raonic's misfortune is Marin Cilic's gain, as the Canadian's retirement opens up the draw for the big-serving Croatian, with no seed left in his half. The highest-ranked player in the bottom half of the draw is Belgium's David Goffin, who ended a wretched run of six defeats in his previous six finals by capturing the Shenzhen Open earlier this month. Goffin, instrumental in Belgium's run to next month's Davis Cup final, had a scare against Australian qualifier Matthew Ebden, losing the first set before coming through 2-6, 7-5, 7-6 (1). The Belgian will meet Frenchman Richard Gasquet in the quarterfinal after he eased through his encounter with Chinese Taipei's Lu Yen-hsun 6-0, 7-6 (5). 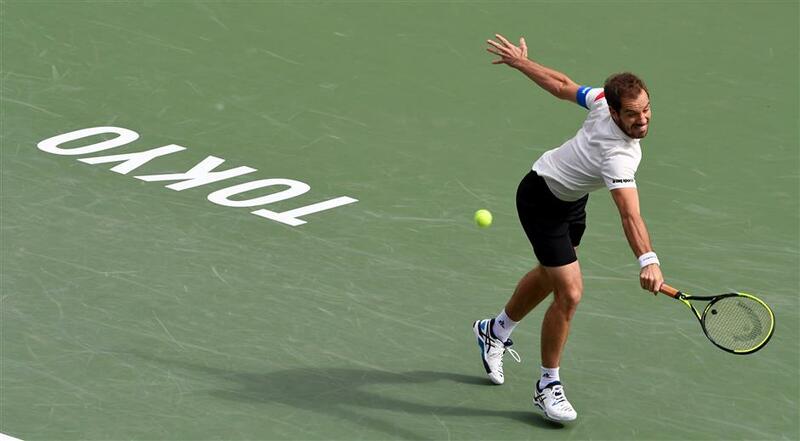 Gasquet inflicted the dreaded "bagel" in the first set against his 63rd-ranked opponent. The second set was much tighter but Gasquet — who has slipped from seventh to 30th in the world — clinched the tie-break 7-5 to book his place in the last eight after 1 hour and 28 minutes. The 31-year-old has struggled with injuries but a recent return to the second-tier Challenger circuit appears to have boosted his confidence. Gasquet won last month in Szczecin and he hopes to repeat his 2007 performance in Tokyo, where he reached the final. Meanwhile, American Steve Johnson followed up his surprise win over Austrian wunderkind Dominic Thiem with a 6-2, 6-4 victory over Ukraine's Aleksandr Dolgopolov. Johnson was especially dominant on first serve, winning an impressive 93 percent of points and 100 percent in the first set. He next faces eighth seed Diego Schwartzman after the Argentine disposed of Australia's Bernard Tomic. Cilic heads the Tokyo field this year at a tournament whose list of former champions includes tennis greats Ken Rosewall, John McEnroe, Pete Sampras, Roger Federer and Rafael Nadal.